The panel discussion was dubbed “25 and Proud” to commemorate Kendal’s founding 25 years ago and to celebrate June as LGBT Pride Month. The eight men and women shared stories of an earlier life that involved inner conflict and fear, of finding and forming relationships to help them become their true selves, and now of living in a supportive community like Kendal. “Here at Kendal, we feel safe. More than safe—belonging to a community where the stated policy of inclusion and the Kendal values are more than words but run true in the life of this beloved community,” Ardith Hayes said. Ardith, the daughter of a Presbyterian minister, grew up in the Midwest during the 1940s and 1950s. “The words ‘lesbian,’ ‘gay,’ even ‘homosexuality’ were not heard. I began to suspect that some women actually lived a different reality, but believed it was not for me, even though occasionally I was tormented by a strong attraction to a close friend,” she said. She attended Yale Divinity School to pursue a career as a Presbyterian minister. After graduation she married a classmate and they had two sons. But Ardith’s conflict continued and after 19 years the marriage ended. “I moved to Manhattan to take a position with Union Theological Seminary — a fresh start, a slightly freer environment and a salary that enabled me to continue to provide financial support for my family. My growing up process began anew. In the midst of re-orientation and grief, I was surprised by joy. Her name is Ruth Ann,” Ardith said. In 2008, after 28 years together, Ardith and Ruth Ann were legally married in California and moved to Kendal in 2011. Ruth Ann, who served as the panel moderator, read an excerpt from Armistead Maupin’s “Tales of the City” series about gay life in 1970s San Francisco. In a letter to his mother, a 20-year-old gay man explains what being gay means to him. “It’s not hiding behind words, Mama. Like family and decency and Christianity. It’s not fearing your body, or the pleasures that God made for it. It’s not judging your neighbor, except when he’s crass or unkind. Tom grew up during the sexual revolution of the 1960s, but he feared coming out for many reasons – threat of criminal and legal constraints, potential shunning from church members, danger of economic ruin, the possibility of profound loneliness. He married in 1970. “I would fake it until I made it,” he said. But the revolution finally caught up with him in 1984 when his wife kicked him out of his comfortable nest. “What a magnificent gift she gave me,” he said. His partner of 29 years died in 2015 and he moved to Kendal in January 2018. This summer he will return to Ferry Beach, Maine, where an annual conference of gay brotherhood called GAYLA takes place. In the 1970s Ann was a teacher, activist and community organizer when it “clicked” that she was a lesbian. “The peace and justice community I was a part of really wasn’t ready for the changes that women were making. Many leftist communities, even some of my friends, thought it was counter-revolutionary to be a lesbian and support gay rights. Interfaith communities and many religious progressive leaders and members thought it was a sickness to be homosexual and that talking about such things detracted from the issues that were important. In the women’s movement, lesbians were demanding a voice and a place at the table. As far as many women were concerned, there were enough problems to be dealing with without dealing with lesbianism,” she explained. She and other lesbians began to build their own community where they would be accepted and could advocate and provide services. She left her teaching job because she knew there was no future for her as a lesbian, and got a job in a factory, where she worked for 20 years. “Coming out is not something you just do once. It is something LGBT people do all of their lives. It was a great relief to me in 1998 after I retired from GM with a small pension and considerable savings to no longer fear for my job, or have to face the anger and rejection, non-cooperation of co-workers because of my being a woman and lesbian,” she said. Ann moved to Kendal with her partner Nancy Lombardi in 2015. Dwight grew up in small, conservative New England town where he learned that “homosexuality” was wrong. He knew he was different, but he didn’t talk about it. “After graduation, I worked for the YMCA for twenty years, where I remained in the closet because I suspected (probably correctly) that being gay would not have been acceptable,” he said. The YMCA job took him to 20 Lakota reservations where he studied their teachings. “I learned that the traditional Lakota recognized and accepted the special role of a third gender, the winkte, or ‘man who is like a woman,’ as a kind of holy man, who has the power to heal and to see the future. Historically, the winkte have been considered a social category of male-bodied people who adopt the clothing, work, and mannerisms that Lakota culture usually considers feminine. Many North American indigenous cultures recognized similar third and fourth genders,” he explained. He came out in the late 1980s to close friends and family, though was still in the closet when he moved to the Deep South in the mid-1990s to work with college international and study abroad faculty and students. “I could give support and encouragement to LGBT+ students, help the first international trans students find the support they needed, and according to one gay staff member in my office, I helped to save his life and encouraged him in his marriage to an international husband,” he said. Dwight moved to Kendal in 2013. “I represent the T of Kendal’s LGBTA+ association,” said Joyce, as she began the story of her seven-decade journey to become a transgender woman. In 1971 she met her future wife, Barbara, and shared her “deep, dark secret. To my relief, Flower Child Barbie did not clutch her pearls and run screaming from the room as I had feared. I had found acceptance,” Joyce said. Barb is the A in Kendal’s new group—Ally. Barb accepted Joyce’s secret and occasionally attended transgender gatherings with her. Barb said she met many men and women who felt betrayed because they had not been told upfront that their spouse was transgender. A few years ago, Joyce traveled alone to Erie, Pennsylvania, to get a wig styled. She texted a photo of herself to Barb. “It was the most genuine, happiest smile I had ever seen, and I decided Joyce’s got to be this happy all the time,” Barb said. In 2016 Joyce legally became a woman. In May, the couple moved to Kendal. “Barb found Kendal at Oberlin, but we weren’t sure that LGB extended to the T part of the alphabet. But coming through the door to Kendal at Oberlin we found a place and people who have been tremendously warm and welcoming. It is a great relief to be able to live my life as my ‘authentic self,’” Joyce said. Robert said early on at Kendal he and Ted had a troublesome experience. Robert is a novelist and offered his books to Kendal’s library and gift shop. Both committees said they were not interested in displaying or selling his books. 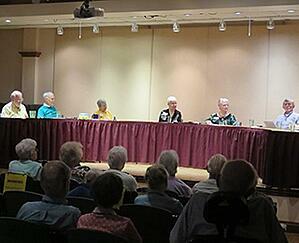 But after a successful book reading event at the Oberlin Public Library, the committees changed their mind. “In all of the years since those first couple of thoroughly unanticipated jolts, Ted and I have felt not just tolerated, but truly embraced as valued members of this community. We gave you the gift of the opportunity for this to be so, and you gave us back the gifts of admiration, respect, and, may I even say, love. We will be forever grateful that this is the place where we will spend the rest of our lives. Thank you from the bottom of our hearts,” Robert said. Four years ago, after 39 years together, Robert and Ted were finally able to marry. LGBTA+ (Lesbian Gay Bisexual Transgender Allies Plus Interest Group) is an awareness, advocacy and support group for lesbian, gay, bisexual, transgender and other gender non-conforming residents, staff and allies at Kendal at Oberlin. We gather at called meetings to socialize, to plan activities supportive of LGBT+ people and to learn about issues facing LGBT+ seniors and others across the age spectrum. LGBT+ residents, staff and allies of this group intend to be a visible presence at Kendal at Oberlin, to provide support, as we are able, to LGBT+ residents of Kendal and to join with others in the City of Oberlin, Lorain County and Oberlin College in advocating for LGBT+ and other gender non-conforming persons.